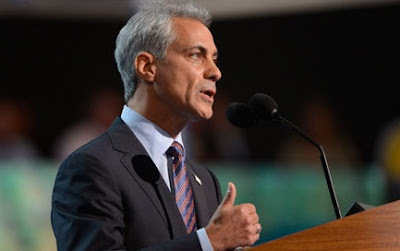 In this video, Chicago Mayor Rahm Emanuel speaks about the Chicago (Public Schools) Teachers' Union Strike which has just concluded its first day. At the 1:25 mark the former White house Chief-of-Staff begins counting on his thumb - which is unusual for 95% of North Americans. Most Americans, Canadian's and Mexican's begin counting on their index finger (aka forefinger) with the middle finger second, ring finger third, etc. - then the thumb last. This variation of forefinger-first counting tends to be accompanied by an inadvertent pointing at the audience - which is a universally negatively received body language signal. Essentially all cultures find it offensive. Conversely, most Europeans begin counting on their thumbs (except for the U.K.). This is preferred because it can also be used as a "Thumbs-up" gesture - which, in North America, is a positive nonverbal signal. This nuanced body language configuration thus has several beneficial meanings in addition to the obvious enumeration - it engenders qualities of authority and assertiveness to the speaker - in addition to sending messages of optimism.